A crucial factor in understanding the chemical reactions is the knowledge of the molecular structure of the various chemical species. The geometry of the molecules decides the fate of a reaction to a large extent. Although defining the structure of a large molecule according to any fixed geometric shape is not practical, the same can be easily done for smaller molecules and ions. To understand the structural geometry in simplistic terms, the usage of three theories are widespread. In a molecule EXn having E–X single bonds, each pair of valence shell electrons on the central atom E are of stereochemical signiﬁcance, and the molecular shape is determined by the repulsion among those. Maximum repulsion ensures a geometry where the repelling electron pairs are at the farthest from each other. lone pair–lone pair> lone pair–bonding pair> bonding pair–bonding pair. triple bond–single bond> double bond–single bond> single bond–single bond. 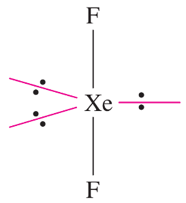 Repulsions amongst the bonding pairs in EXn is subject to the diﬀerence in the electronegativities of E and X. More the electronegativity of X, less is the inter-electronic repulsion. 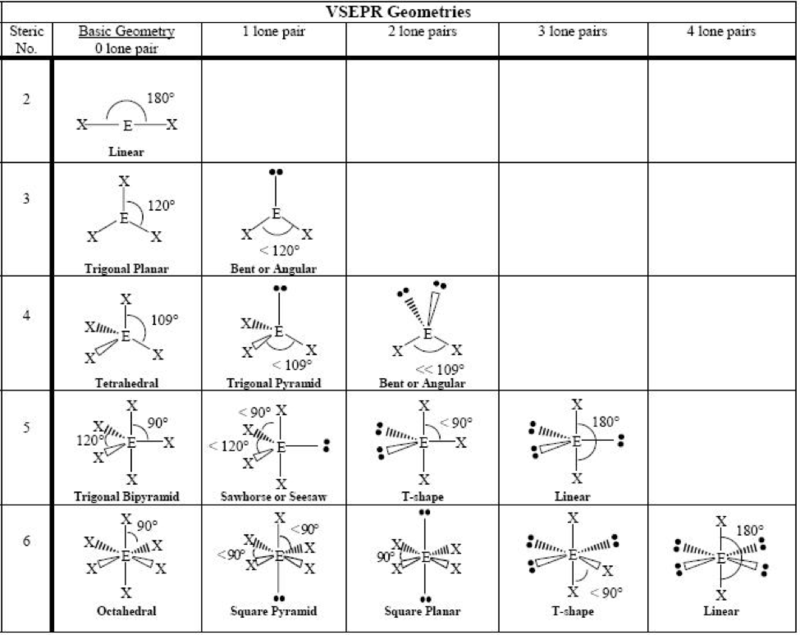 Some key points are to be noted while using the VSEPR theory for structure prediction. There is a distinction between the “geometry” and “shape” of a molecule/ ion. Geometry includes the lone pairs while the shape includes only the bonding pairs. For example, XeF2 has a parent trigonal bipyramidal geometry in which the 3 lone pairs occupy the equatorial plane in an attempt to minimize the lp-lp interaction (see rule 2). As a result, the shape becomes linear. This theory works best when dealing with p-block element halides or other simple molecules which do not contain bulky groups. The steric effect of the bulky groups is not considered. VSEPR is not applicable to the compounds of d-block elements. The inclusion of d and later orbitals is crucial to the accuracy in prediction of structures for a wide range of compounds including the coordination complexes and many types of organic compounds. An effective way to accomplish this task is using the Valence Bond (VB) Theory. It is based on the knowledge of the shapes of different atomic orbitals and their mixing to deliver “hybrid” orbitals. Hybridization, hence, is the pivotal point in VB theory. Hybrid orbitals are formed by overlap of atomic orbitals. The number of hybrid orbitals formed is equal to that of the atomic orbitals mixed. Hybridization always starts from an s orbital, followed by p orbitals, and if needed, d orbitals are included. 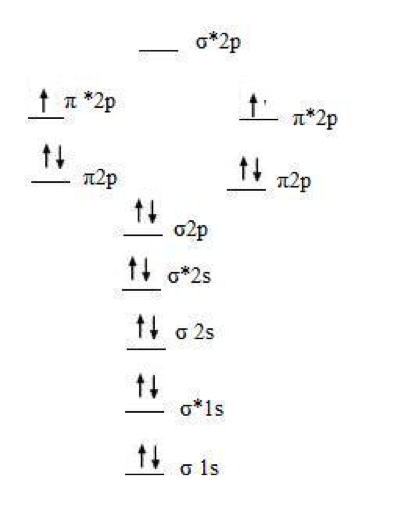 If, in the atomic orbitals there is more than 1 unpaired electron, multiple bonds can be formed but electrons paired in the valence shell are not included therein. Directionality is present in covalent bond and it is parallel to the space of overlapping between the atomic orbitals. The pattern of overlapping, ensures two kinds of covalent bonds namely sigma and pi bond. A sigma bond is formed by front-on overlap of atomic orbitals while pi bonds are formed by side on overlap. The shape of the molecule/ ion depends on the number of lone pairs present. Since it is a theory, it has some drawback, most notably in the prediction of para/diamagnetic behaviour of molecules. It also suffers from the inability to account for the tetra-valency of carbon. The initial VB theory also considered electron pairs as localized. However, modern VB theory incorporates the idea of delocalized electrons. Total number of MOs formed, must be equal to that of AO combined to make them. BondingMOs have lower energy than the AO forming those. AntibondingMOs have higher energy than the AO forming those. The MOs are filled up according to the Pauli’s exclusion principle and Hund’s rule. Atomic orbitals having similar energies only, combine to form MOs. Bond order = half of the difference in the number of bonding and antibonding electrons. A bond order of 1 indicates a single bond, 2 indicates a double bond, 3 indicates a triple bond while fractional bond orders indicate intermediately strong bonds. The strength of a bond is directly proportional to the bond order while the length is inversely proportional to it. The MO theory can also accurately predict the magnetic behavior of a molecule/ion. It explains the double bonded molecule and its stability. The 2 unpaired electrons explain the experimentally observed paramagnetic behaviour.